I love love love love fall. This fall has been supremely more busy than most of the previous autumnal seasons combined, for our family. But, so it goes. I got my recent Martha Stewart in the mail last week and was itching to do some baking – it has been far far too long since I have whipped up something creative in the kitchen. Grad class, new school, eldest child starting kindergarten, and upcoming presentation at the art educator’s conference has been keeping me racing from one event to the next. I look forward to some down time in December, perhaps. Here is a hilarious picture of the three of us on our first official day of school. Big thanks for Eric for taking this picture and holding it together far better than I on her first day of kindergarten. 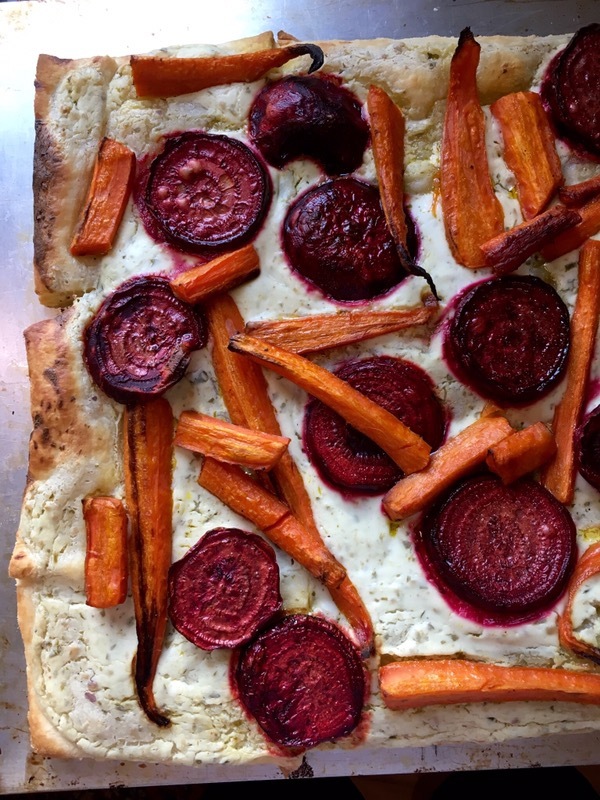 I found recipe for a tart that looked divine – but being short on time and dealing with some picky eating phases, I swapped and changed a few things. For starters, I made a simpler sauce from sour cream and pesto. WIN! I just love a successful Martha Shortcut, as I call them. Let’s be honest, her magazine and recipes are amazing but simply not realistic for most of the population. 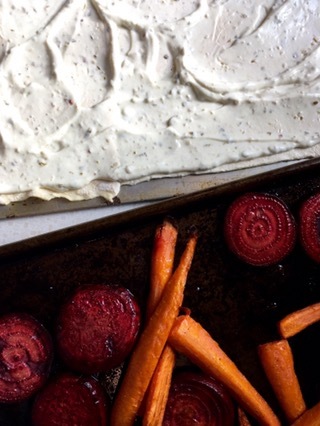 I roasted the beets and carrots smaller than recommended, to speed up the cooking period. Martha Stewart’s recipe called for a hazelnut-cilantro chermoula sauce. This is a North African sauce that can also be served over eggs at breakfast. It sounded wonderful, other than the cilantro, I absolutely hate cilantro, it tastes like metal to me. I would have made the sauce, had I had the lemon and hazelnuts needed. Instead of cilantro, I would have opted for parsley. I swapped the phyllo for 2 sheets of puff pastry, because it was what I had on hand. It baked up beautifully and made the entire house smell amazing. Every time I see beets, I just want to get out my paint set and get to work depicting them in layers of acrylic and swirls of watercolor. 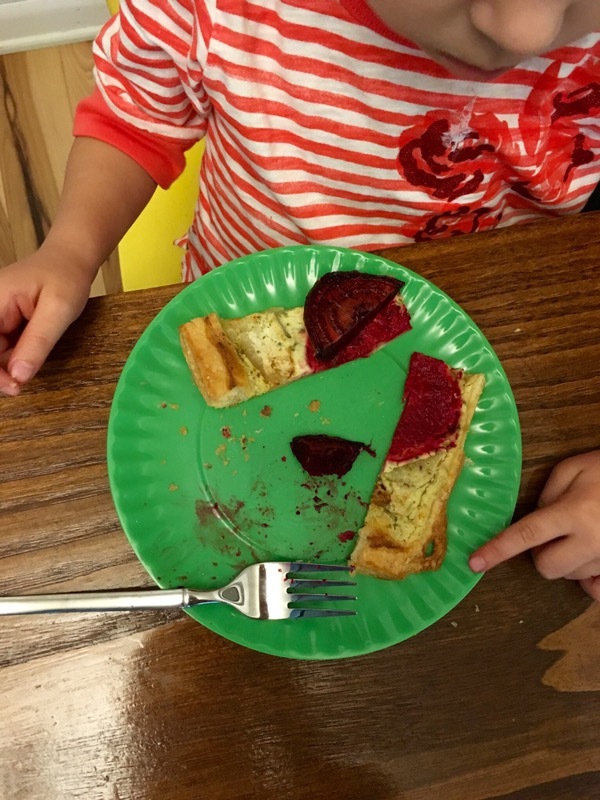 My children both enthusiastically devoured their tart, asking for seconds and thirds. 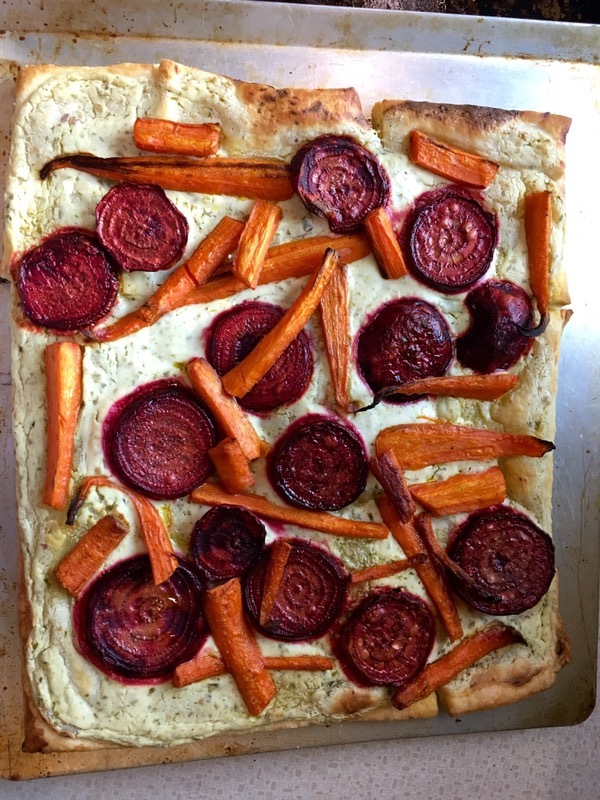 My daughter declared, “This is the best pizza you have ever made, Mommy!” Grateful for being short on time and ingredients to find this delectable tart that we will be sure to be making again soon, with some variations in the roasted veggies on top. Preheat oven to 425°. Peel and cut 3 medium beets into 1/2″ slices. Peel and slice in half, 1 pound of carrots (about 12). Put on rimmed baking sheet, and toss with about 3 tablespoons of extra-virgin olive oil. Roast, turning once, for about 30-35 minutes, until browning in spots and becoming tender. Start checking on veggies around 25 minutes, for doneness. 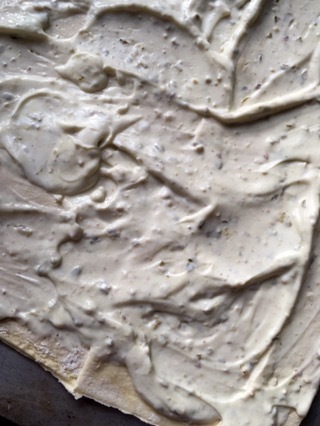 Place 2 thawed puff pastry sheets onto a large baking sheet. You may cut to fit together. Overlap slightly, wetting with fingers, and pressing together to make a solid sheet. Brush lightly with olive oil. For sauce, combine: 8 oz sour cream with 2 tablespoons pesto. Bake for 8-10 minutes or till pastry is puffed and slightly golden. Remove from oven. Spread pesto sauce over entire puff pastry. 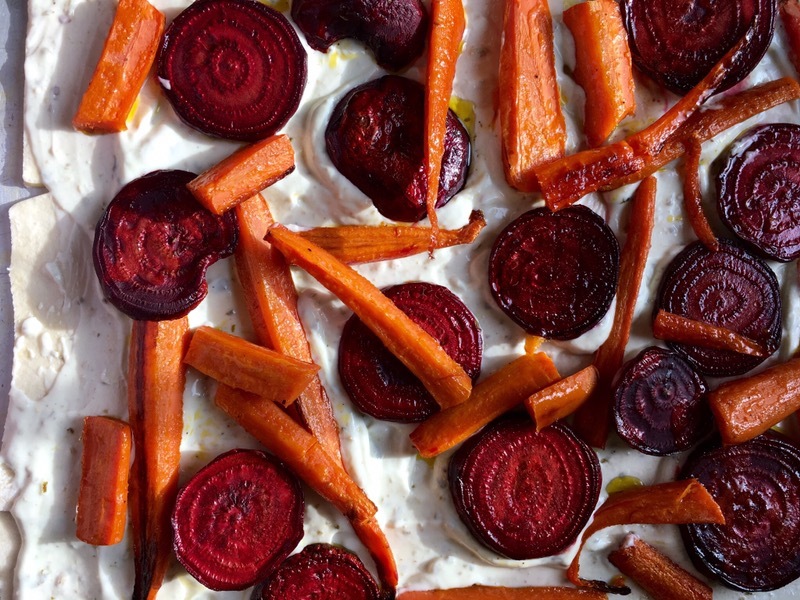 Arrange roasted beets and carrots on top. Reduce oven heat to 375°. Return tart to oven, bake for 10-15 minutes more, or until sauce is set and pastry is done.